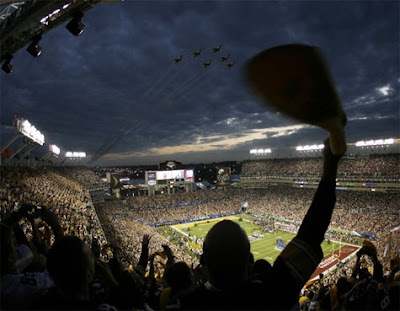 A Pittsburgh fan waves a terrible towel as the USAF Thunderbirds do a stadium fly-over before the start of Super Bowl XLIII in Tampa, Florida. Gee I wonder if McCain posted this? Those jets are always more impressive than a game. Oh, but of course John McCain is not computer literate. He only knew how to fly.